CLEVELAND — A Wind Chill Watch is in effect from 10 p.m. Tuesday through 1 p.m. Thursday. Wind chills as low as 30 to 35 below zero are possible, with the coldest wind chills as low as 40 below zero possible Wednesday and Thursday morning. This watch is for north central and northwest Ohio. 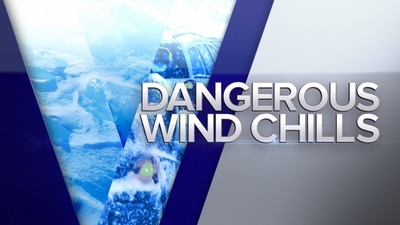 The dangerously cold wind chills could cause frostbite on exposed skin in as little as 10 minutes.A Wind Chill Watch means there is the potential for a combination of very cold air and the wind to create dangerously low wind chill values. Monitor the latest forecasts and warnings for updates on this situation. An arctic blast of cold temperatures will move into the region Tuesday night behind an arctic cold front. High temperatures in the lower 20s to upper teens early Tuesday will quickly fall to below zero across the area Tuesday night. Temperatures will likely remain below zero through Thursday. High temperatures across the area may not go above zero degrees on Wednesday for the first time since January 1994 in many locations. Low temperatures on Wednesday and Thursday morning will be the coldest temperatures the region has felt since February 2015 and could break daily records by several degrees. From Tuesday evening to Thursday afternoon, winds 10 to 20 mph across the area with gusts to 30 mph will allow for wind chills of 25 to 35 degrees below zero, with some spots in northwest Ohio perhaps getting as as cold as 40 degrees below zero. This will allow for life-threatening cold conditions.